Research and clinical laboratory facilities are, perhaps, the mostcomplex structures to plan and design. Intimidated by a vast andseemingly impenetrable body of codes, regulations, and designcriteria pertaining to lab design and construction, manyarchitects, unfortunately, choose to avoid what can be one of themost profitable and professionally rewarding areas ofspecialization. Written by an architect with more than thirty-three years ofexperience as a master planner and programmer of laboratories andclinical facilities, this book demystifies the process oflaboratory planning and design. It provides a comprehensiveoverview of the fundamental issues related to laboratory design andoffers readers detailed, step-by-step guidance through the complexmaze of design specifications and codes, standards, and officialguidelines that must be addressed during the programming, planning,design, and construction process. 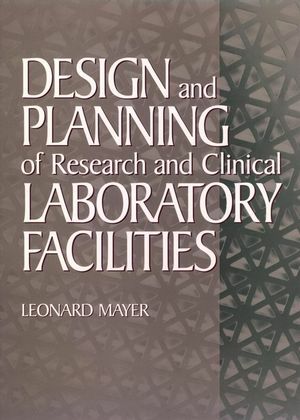 Focusing mainly on laboratory programming, planning, and designcriteria for "wet" laboratory environments, Leonard Mayer providesexamples from numerous master plans, facility programs, functionalprograms and requirements programs applicable to a wide variety ofscientific and medical disciplines, and related facilities. Relatedfunctions and activities include administrative offices, computercenters, core service and support, building services facilities,and more. He presents new and updated design criteria based onrecent laws and regulations and supplies readers with comprehensivelists of relevant codes, regulations, standards, guidelines, andarchitectural, structural, mechanical, electrical, and plumbingcriteria. Design and Planning of Research and Clinical Laboratory Facilitiesis an excellent primer for architecture students and newcomers tothe field, as well as an indispensable single-volume reference forexperienced professionals. It is also an invaluable resource forresearchers and investigators, facility planners and managers,plant engineers, and all others involved with the design,construction, maintenance, and administration of laboratoryfacilities. LEONARD MAYER, AIA, is Principal of The Planning Collaborative,Ltd., a consulting firm that specializes in programming andplanning laboratory and health care facilities. He has masterplanned and programmed more than 22 million gross square feet ofresearch and clinical laboratory and health care facilities. Mr. Mayer is a former director of Professional Practice Programs atthe American Institute of Architects and the editor of ArchitectsHandbook of Professional Practice, AIA Documents Series, and theFirst Edition of Legal Citations File. He also assisted the Collegeof American Pathologists' Laboratory Function and Design Committeein the revision of the Medical Laboratory Planning and DesignManual and is currently a member of the National Committee onClinical Laboratory Standards' Subcommittee on Laboratory Designand Safety. Laboratory Core Service and Support Facilities. Laboratory Work Areas: Standard Plans and Details.